It’s amazing just how sweet vegetables can become when baked in cakes. Some can be grated and stirred in to give an almost fruity flavour.Carrot cake must now be one of the most popular cakes for slicing into at teatime. It’s easily made without sugar – and is always sweet and delicious. Try a cream cheese topping on it, which can also be whipped up quickly without sugar. 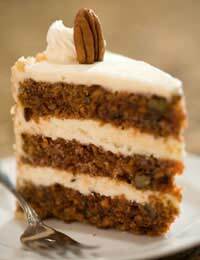 A great alternative to carrot cake, however, is courgette (or zucchini) cake. Courgettes can be grated and used in cakes in much the same way as carrots. Few people make this version but it is just as moist and flavoursome as its carrot equivalent. This is a very filling, moist cake. Nuts give it extra bite but can easily be removed if someone suffers from an allergy. Preheat your oven to 180 deg C/350 deg F/gas mark four. Grease a 20cm (eight ins) cake tin. Melt your butter and honey in a small pan over a low heat. Place your flour, salt, bicarbonate of soda and allspice in a large bowl. Mix in your hot liquid. Beat your eggs then add to the mixture too. Grate your carrots then stir them into the batter, along with your chopped nuts. Pour into your tin and bake in the centre of your oven for about 40 minutes or until cooked all the way through, and a skewer comes out clean. Remove from the heat and allow to cool. Beat your cream cheese with your sugar free apricot jam. Once cool, cut your carrot cake in two. Spread your cream cheese mixture inside and on the top. This recipe for courgette cake is simply delicious. Also, by avoiding the use of eggs and nuts, it may be ideal for some people with allergies, as well as those keen to avoid sugar. Cream your butter and two thirds of your sugar free apricot jam together in a large bowl, until light and fluffy. Add your vanilla essence and a splash of full fat milk. Grate your courgettes and stir in (do not bother to peel first). Add your plain flour and bicarbonate of soda. Stir thoroughly again. Grease a 20cm (eight ins) cake tin and pour the mixture in. Bake in the centre of the oven for approximately 30 minutes, or until golden brown and an inserted skewer comes out clean. Allow to cool before removing from the tin. Slice in two and spread the remainder of your sugar free apricot jam inside. Sprinkle on top with ground cinnamon – and slice.